We have a dead mouse in a bag in our fridge. It is on the feta. The reason we have said mouse is that we are now the proud parents to a baby barn owl. It is very possibly the oddest, ugliest creature ever and it is Frannettes 3rd attempt at raising a baby. Third time lucky hopefully. Good thing she is having more luck raising children, considering they are my children. Ozzy Owl has a badly broken beak and looks like he is in pain. He probably fell out of the nest onto his face. He doesn’t look very bright. Joyce found him at South Gate. Apparently he had been lying in the hot sun all day but when she brought him to us later that day he was fairly sprightly and was taking water eagerly. 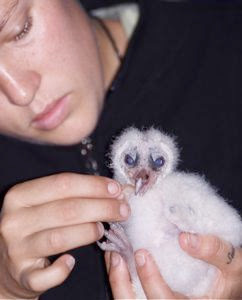 The downside of raising a baby barn owl is feeding a baby barn owl. I had just banned Pricka catching mice in traps, which he had been doing with alacrity while we were on leave, but now have to tell him to resume the repugnant task. It is one thing to catch a mouse but neither Frannette or I have the stomach (or heart) to chop it up. So we waited for Brad, who wont develop post-traumatic stress as a result, to do it. I have seen him dissect a dead lechwe, examining it’s heart as if it was a good book, and not bat an eyelid, so I doubt he will have any qualms about making mince out of the mouse. (Don’t ask him to change a pooh nappy however. That is too much, and he will physically vomit. I have witnessed this myself). Brad duly chopped it up before dinner. From the table we could hear Frannette retching as she attempted to get the gooey bits of innards into the baby. She certainly is pushing all her limits. Nothing wrong with her determination or her spirit. Pricka then caught a large rat for Ozzy and filleted it, so it is all ready to be tomorrows meal. I have discovered that Ozzy loves having his head and body rubbed with ones nose while making clucking sounds. This makes him close his eyes and swoon with delight. He is very perky and prospects for his survival seem good. I have e-mail a vet about his broken beak and injured leg. Hopefully we can get him to a point where he is able to fend for himself so he doesn’t have to be fed his whole life. Of course Keita loves Ozzy and wants to hold and touch him all the time. We have to hide him (we think it is a him) or physically restrain her. She calls it the chicken. In addition to everything else she does, Frannette is teaching Pricka to drive – brave girl. He seems to be doing well despite the fact that he hasn’t even steered a car before. They head off diligently for 30 minutes every day and return with her pale and shaken. He is clearly enjoying it though and needs something to stimulate him out here.